For the second consecutive year, Middle Georgia State's Cyber Knights Competition Team is one of only eight teams to advance to the regional level in the annual Southeast Regional Cyber Defense Competition, to be held at Kennesaw State University. Making it that far into the competition is like a sports team making it to the playoffs. Twenty-four college and universities competed at the state level. Besides Middle Georgia State, the teams that advanced are College of Charleston, Georgia Regents University, Montreat College, Tennessee Technological University, University of Central Florida, University of North Carolina - Charlotte and University of South Florida. The top eight performing teams will compete in the on-site regional competition, to be hosted at Kennesaw State April 7-8, 2015. The winner of the on-site regional competition will represent the Southeast region at the National Collegiate Cyber Defense Competition in San Antonio in late April. The largest competition of its kind, the National Collegiate Cyber Defense Competition, sponsored by Raytheon, Department of Homeland Security, Akamai and the National Security Agency, provides college students from across the country the opportunity to test their skills at protecting a network against cyber threats and highly skilled hackers from across the world. Middle Georgia State's team is coached by IT faculty members Johnathan Yerby and Nelbert St. Clair. The student team captain is Jimmy Aleman, a senior IT major in the information assurance concentration, who said he did not expect the team to repeat last year's success. "Half of last year's team graduated, so we have some inexperienced members this year," he said. "But the members who did come back from last year tipped the scales in our favor." 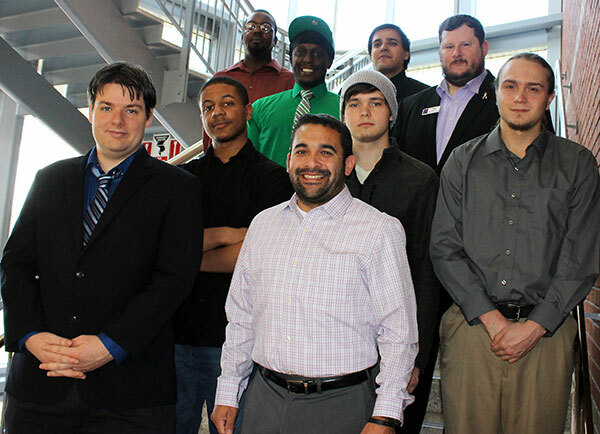 Photo: Left to right, first row, James McMurran, Jimmy Aleman; left to right, second row, Walter Hoskins, Kelli Grubbs, Justin Lewandowski; third row, left to right, Artise Washington, Johnathan Yerby (faculty coach); fourth row, left to right, Jermain Mitchell, Lee Ibrahim.